Dil Se..: Show me Your Wholegrains! You may already be eating whole grains. In a movie theater when you munch on some delicious popcorn, or enjoy a bowl of Quaker's hot oatmeal, you're probably focusing more on the delicious taste than on the fact that these foods are whole grains. Whole grains include grains like wheat, corn, rice, oats, barley, quinoa, sorghum, spelt, rye etc. – when these foods are eaten in their "whole" form. People who eat whole grains regularly have a lower risk of obesity, as measured by their body mass index and waist-to-hip ratios. They also have lower cholesterol levels. Here are some easy ways to incorporate whole grains in your normal everyday meals. For delicious whole grain recipes check out here and here. Now come on! Join with me in rediscovering the health benefits of whole grains this month. Cook/bake any meal/snack with any whole grain. it can even be something raw like a salad. Multiple entries and non-veg entries are allowed. If you have any entries in your archive, please re-post entries anytime during the event date. Please link back to the event announcement page and feel free to use the logo. Non-bloggers can email me your entries along with recipe and picture. Lovely event will definately send some recipes. Nice theme...will try to send in! Nice theme Divya:-)Will try to send at least one..
Will sent you an entry Divya. The bags of grains look good. Nice one divya..will surely participate. If i bake something with whol grain will send it your way. Greattt event and will send you my entry soon!! 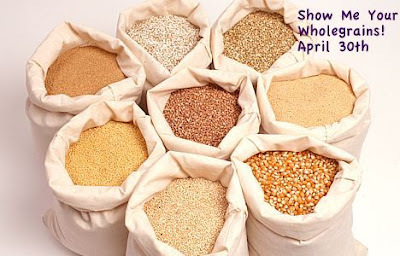 Hi Divya I have many recipes with whole grains in my archive.How do I repost it?Can you let me know.I would like to participate in this event. Sent my entry hope you have recived it. hi divya, just sending in my entry. lovely theme! what happened to this event? As I was on holiday, I could not follow your blog regularly; and today I am checking it. when is the round up or is it cancelled? A peek into my breakfast!